A pair of Nebraska wide receivers are on the initial Biletnikoff Award Preseason Watch List released Thursday morning. 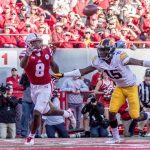 Stanley Morgan Jr. and JD Spielman are candidates for the Biletnikoff Award, presented to the top receiver in the FBS. Nebraska is one seven schools with multiple members of the watch list. Morgan, who was on the Biletnikoff Award midseason watch list last season, enjoyed a record-breaking year in 2017, setting career-bests with 61 catches, 986 receiving yards and ten touchdowns. A second-team All-Big Ten pick, Morgan ranked second in the conference in receiving yards and touchdowns and fourth in catches per game as a junior. Morgan’s 986 receiving yards broke the school record held by Johnny Rodgers. His five 100-yard receiving games were the most by a Husker in school history. In Big Ten play, Morgan was in the top five among conference receivers in 100-yard games (first), receiving yards per game (second) and receptions per game (fifth). Spielman comes off a record-breaking freshman season that saw him earn All-Big Ten honors at both wide receiver and kick returner. As a receiver, Spielman hauled in 55 passes for 830 yards and a pair of scores, establishing school freshman marks in receptions, receiving yards, 100-yard receiving games (two) and all-purpose yards (1,572). In conference play, Spielman became just the second Big Ten freshman since 1985 to lead the league in receiving yards per game during the conference season (88.1). He tied Wisconsin’s Jonathan Taylor for second in the Big Ten with an average of 157.8 all-purpose yards per game in league play and was fifth in catches per game. Spielman established Nebraska’s single-game receiving yards record with a 200-yard performance against Ohio State. The 2018 Biletnikoff Award winner will be presented on December 6, 2018 on The Home Depot College Football Awards presented by Gildan.